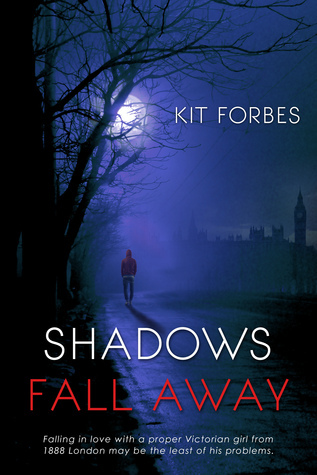 Here's Shadows Fall Away author Kit Forbes telling us what inspired her to write a novel set in the late 1800s--and with Jack the Ripper! The main reason is that I’ve been fascinated with the late 19th century and England my entire life. Being the lover of all things paranormal I like to imagine that particular fascination ties into what Michael Talbot referred to as “resonance” in his excellent book on reincarnation—Your Past Lives. As for including Jack the Ripper? I’m also a long time fan of mysteries and crime dramas. And the concept of no one knowing for certain who Jack was offers so many possibilities that are hard not to explore. A room full of writers would spin the unraveling of the mystery in so many different ways. I’ve always loved picking up books and watching movies and TV to see how others tackled the idea. Also being a lover of wild conspiracy theories one of my favorite wild theories was that Jack was actually Queen Victoria’s grandson, The Duke of Clarence. I first came upon that in a book called Prince Jack by Frank Spiering. The government cover up idea was also part of one of my favorite older movies Murder by Decree where Sherlock Holmes and Watson tackle the crime. And for a really neat take on Holmes vs Jack, The Last Sherlock Holmes Story by Michael Dibdin is one I highly recommend. Ripper Street is one of the most recent offerings (that I believe is on Netflix). It takes place after the crimes stopped but Jack is still very much a lurking presence to the police inspector who was part of the original case. The show had fantastic visuals and I kept imaging mark and Genie moving through the same settings. Sounds like an awesome read! I love history and I think it's great when authors put their own spin on historical events.